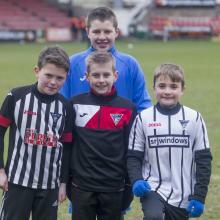 All the winners of the Young Pars Penalty Kick Competition . The final of the 2018 Penalty Kicks competition was held at half time in the Dunfermline v Brechin City match. 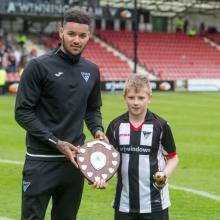 The final of the 2018 Young Pars Penalty Kick competition was held at half time in the Dunfermline v Brechin City match at East End Park. 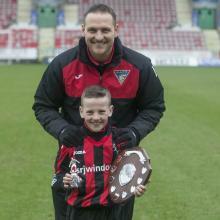 Pars keeper Sean Murdoch presented the winners trophy to eight year old Charlie Walker. The second semi final of the 2018 competition was held at half time during the home match against Queen of the South. The first semi final of the 2018 competition was held at half time during the home match against Morton. The heats of the 2016 Young Pars penalty kick competition were held on Sunday 14th February. Young Pars Penalty Kick final thrilled the fans at half time in Dunfermline`s home game against Stenhousemuir on 13th September. This competition is open to all Young Pars members who enjoy the challenge of taking penalties in a competitive atmosphere. The heats of the 2013 competition took place at Pitreavie on Sunday 16th June at 11.00am. 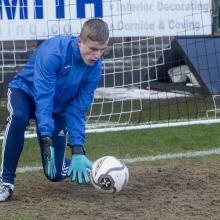 Held at half time in Dunfermline v Cowdenbeath match on Saturday 27th October 2012. .
15 members of the Young Pars took part in the qualifying heat for this seasons Penalty Kick Competition, against Steven Mayne, one of the U19 goalkeepers. The Young Pars penalty kick qualifying heat will be held at Pitreavie on Sunday 27 May at 11.30am. Members aged 7 years and over wishing to take part should contact Christine to note their interest. Seven qualifiers will be required as last years winner, Cameron Shaw, automatically gets through to the heats on the pitch at East End Park at the beginning of next season. The Qualifying heat for the Young Pars Penalty Kick Competition were held on Sunday, 15 May on the Astro pitch at Pitreavie. Seven qualified to join last years winner Declan Pierce in the semi finals. Josh Redpath, Jamie Divertie,Paul Allan and Declan Pierce contested the season 2009-10 Final. The Young Pars penalty kick semi finals were held on Sat 6 and 13 March at the Airdrie and Queen of the South matches. Josh Redpath, Declan Pierce, Paul Allan and Jamie Divertie have gone through to the final to be held at half time on Saturday 24 April at the Pars last home match of the season. Hard luck to the semifinalists who were not successful, but there is always next year! On a very wet and cold morning at Pitreavie, 13 Young Pars turned up to take part in the qualifying heat of the Young Pars Penalty Kick competition. 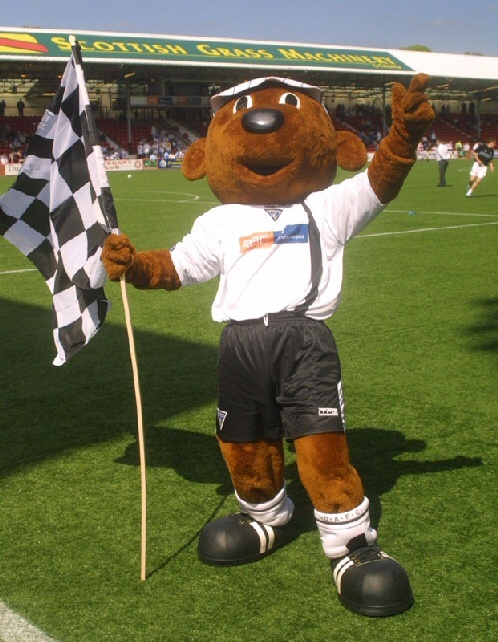 The final of the Young Pars penalty kick competition which was carried over from last season was held on Saturday 22 August 2009. Taking part were Hamish Michie, Adam Ainslie, Daniel McGuinness, and Paul Allan, with John Manderson from Dunfermline Athletic U13’s in goals. Heats to establish the seven to join last year`s winner, Hamish Michie in the semi finals were held on Sunday morning, 15th March.